This lightly ribbed white porcelain heart-shaped coaster is an excellent gift or decoration for anywhere around the home. Place on your coffee table, dining table or bedside table to hold your favourite drinks and display the sweet message in your home. The front of the design features an engraved illustration of a row of dainty houses. 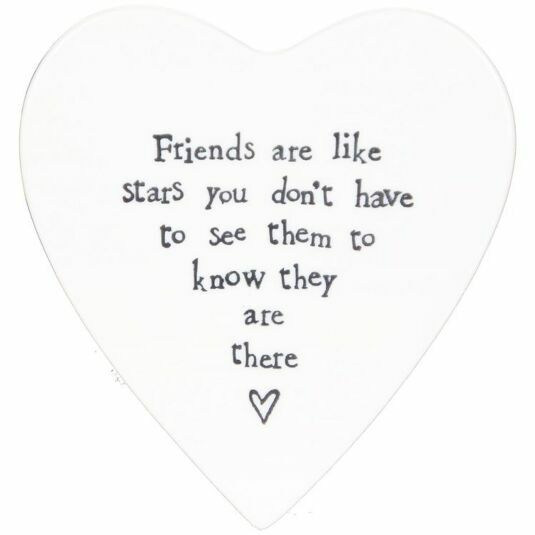 The heart reads: 'Friends are like stars you don't have to see them to know they are there’. This coaster has a foam pad underneath so you don't have to worry about it scratching or marking your favourite furniture! 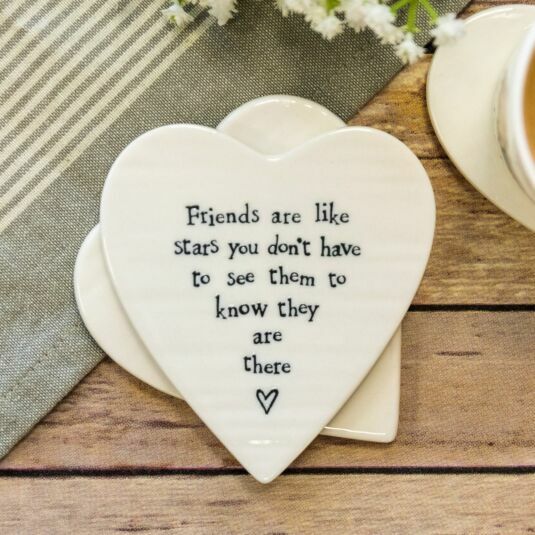 A brilliant way to add a small, unique touch to your home and remind you of what's really important, this item makes a wonderful birthday or new home gift for friends and family to treasure forever. With over 800 products in stock, TemptationGifts is the most comprehensive stockist of East of India to be found on the web. We work closely with our friends at East of India to make sure that every time they add new products to their huge portfolio, we put them straight into our 'New In' category. It’s reassuring to know that we are East of India’s biggest independent account. So whether you’re in one of our high street stores, or you’re shopping online, you know you’re dealing with a company which loves East of India as much as you do! Discover even more about East of India and our relationship with them by clicking here.